That’s right, folks. Owen decided to finally start crawling! 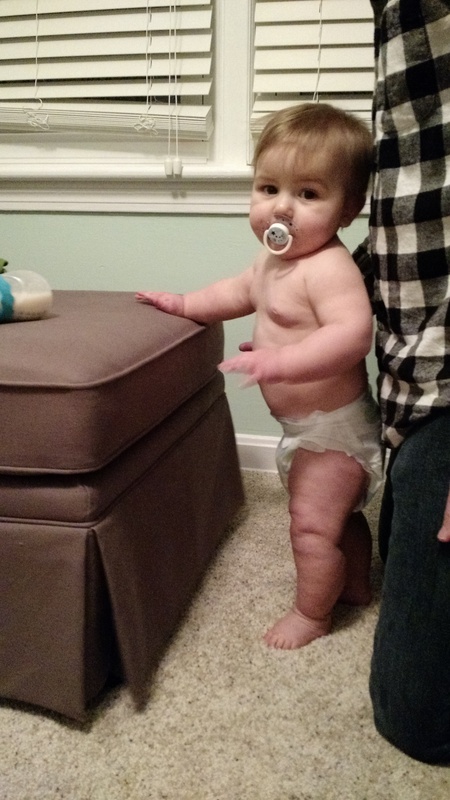 I really thought he was just going to bypass the crawling stage and go straight to walking, but he fooled me. 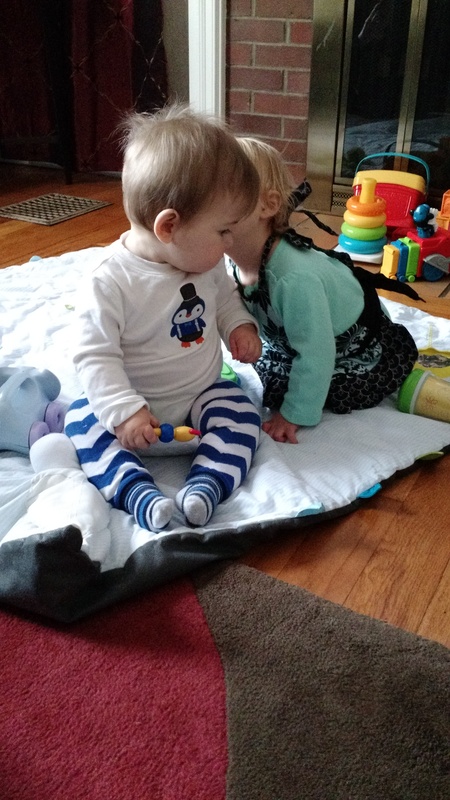 Yesterday at daycare they said he crawled to lunch and everyone cheered for him. Of course he would crawl to where the food is :). It is so funny to see his little bum going back and forth with him cruising around. When he was crawling last night he kept going straight into the pantry. So I made a note to myself that we will somehow need to keep the pantry door closed before he starts helping himself to Cheerios. Also while he was in his nursery he decided to pull down his noise machine by the plug. He never really like that thing anyway. For fear of Owen choking on some dust bunnies or whatever else he might start to find on the floor I need to start cleaning better. What do other parents use on hardwood/tile floors? I will have to do some research. Once we have a good video of Owen crawling around I will post. 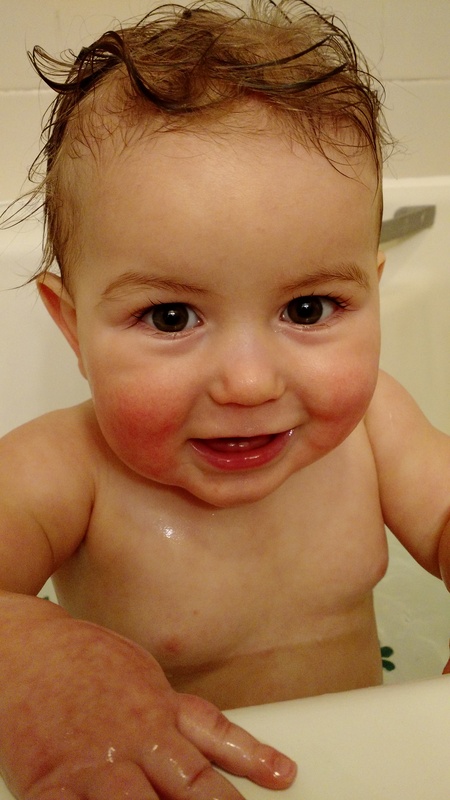 Until then here is a fun bath time picture. I realize that I kind of went on a rant while Owen was sick a week and a half ago. It just gets so frustrating when he can’t let us know what hurts, and we’re not able to do anything for him. Luckily he is doing much better now and has been smiling and eating a ton to make up for it. 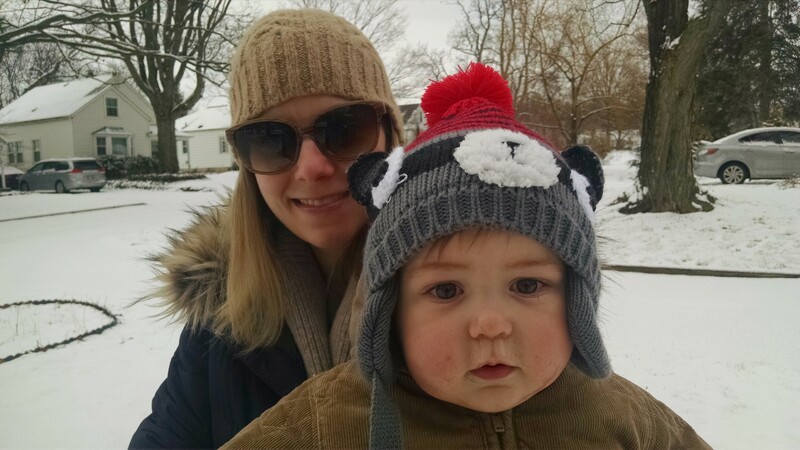 Here are 7 joys of parenthood I’ve experienced these past 10 months – I’m sure other parents can relate. 1. Evenly distributing baby wipes and binkies in every room of the house. 2. Mid-week visits to Target for more tubs of formula. 3. Finding out that not all doorways are baby gate width, and realizing that a door can work just as well. 4. Cleaning smooshed food out of hair on a consistent basis. 5. Snot sucking as a parental team. 6. Being the target of projectile vomit when Owen was sick. 7. Seeing the dreaded daycare caller ID while at work. On a lighter note, I’ve had more of a reason to bake. 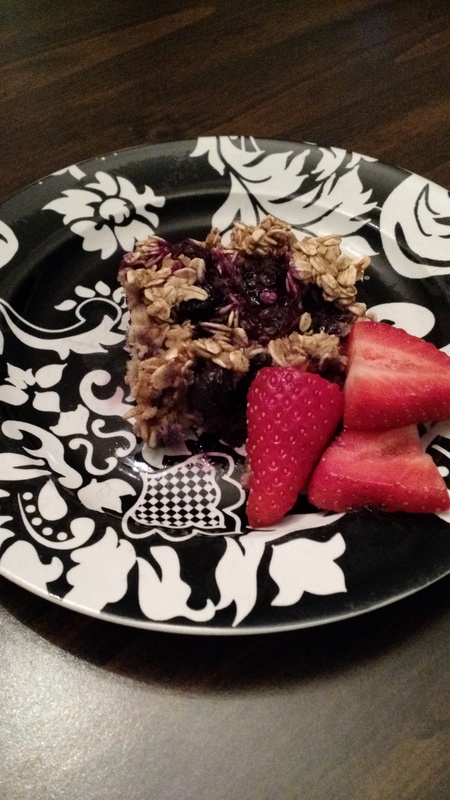 Here is what a baked last night for breakfast. It was easy to make and healthy (before I added the maple syrup). Enjoy! 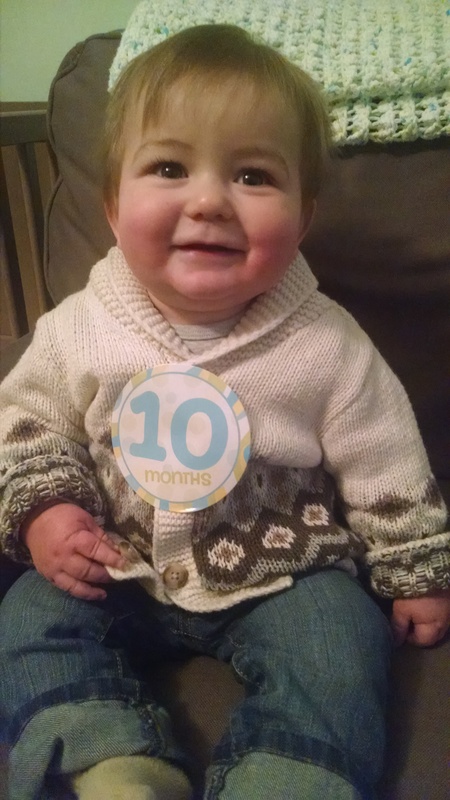 Today Owen turned 10 months old. 10 months seems crazy to me. There are only 2 more stickers left :(. He was such a good sport this morning while we were taking his pictures. He even smiled before he had any breakfast. Now that he is 10 months he is really getting good at holding his sippy cup on his own. He still has a few bottles during the day but way less than he used to have. While at daycare he has a morning snack, lunch, and an afternoon snack. Then once he comes home he has dinner. Sometimes before bed he has a bottle, but not always. So far he isn’t picky with what we feed him. I am hoping that he takes after his dad and isn’t picky with food. We shall see. This week I made a few things to have on hand to heat up for Owen to eat. They are both pretty much snack food so I still need to make something for a main course. I always have some fruit, cheerios, yogurt, and applesauce on hand for emergencies (screaming Owen not wanting to wait 30 seconds for the microwave to heat the food). Here are the receipes that I made and froze for quick snacks. What are some of your favorite quick meals to have on hand for the little ones? Poor Owen has another ear infection. I guess that is why he has been so crabby lately. We thought it was just a cold, but we wanted to make sure. We started another round of medicine after Tony took him to the doctor on Friday. He seems to be keeping most of it down. 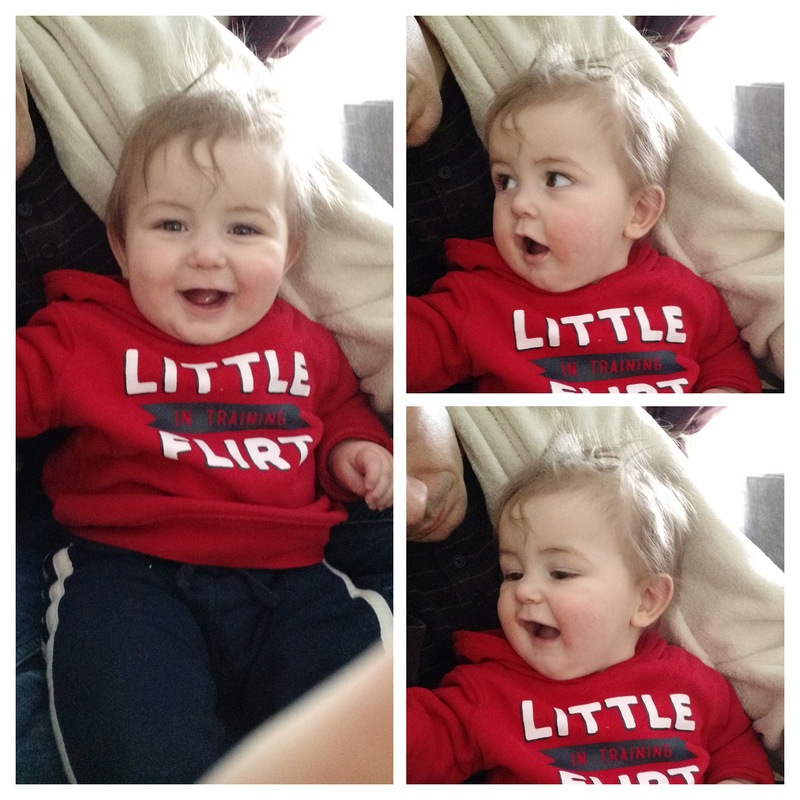 He is so stuffed up that when he coughs he sometimes throws it back up. I feel so bad for him, but the doctor said that it is just a cold and there is really nothing we can do about it :(. I am really hoping that he gets over this soon and starts acting more like himself again. 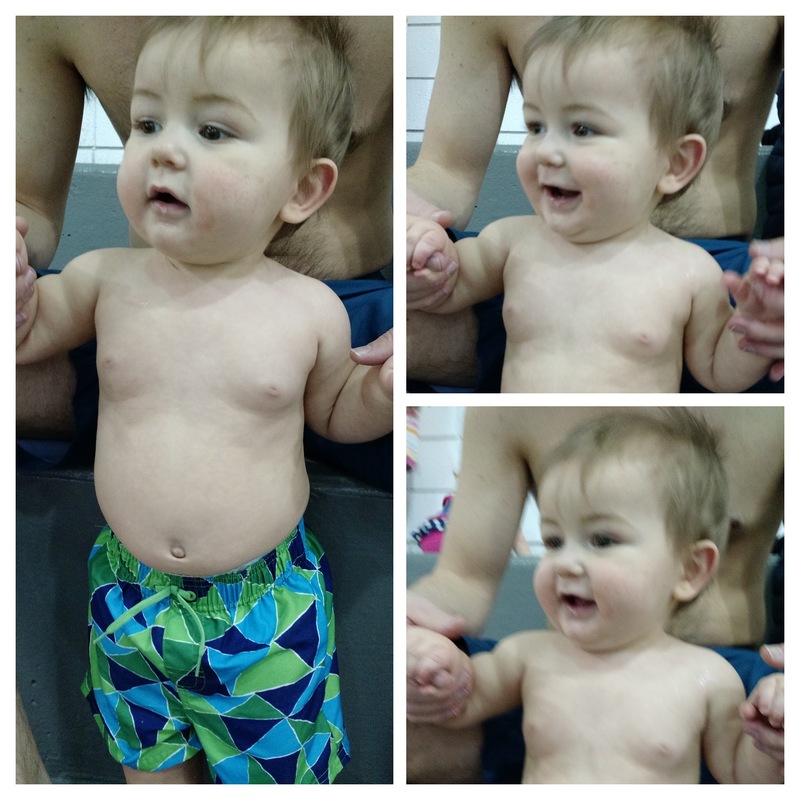 Even though it is snow and in the single digits this weekend Owen had his first swim lesson. Both of us were in the pool with him hoping that he would enjoy it more that way. 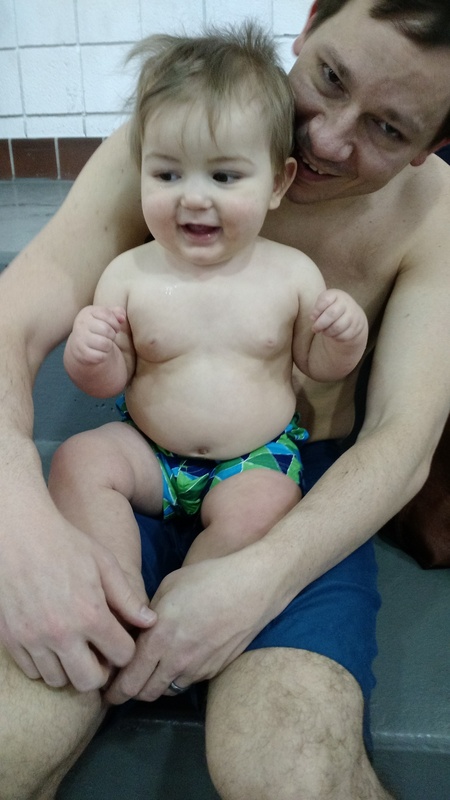 We started in the big pool and tried to get Owen more comfortable with the water. He didn’t love being in the big pool, but once we played with some water toys he started to come around. The bigger pool water was cooler than the baby pool. I think that was the main reason he didn’t enjoy it. That and his ear was probably hurting him. Once we went into the baby pool he even smiled. 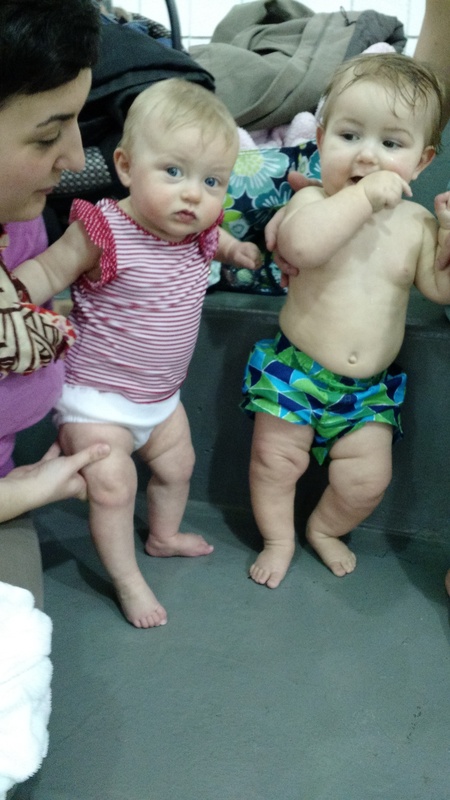 With this class I am hoping that he becomes more comfortable in the water. 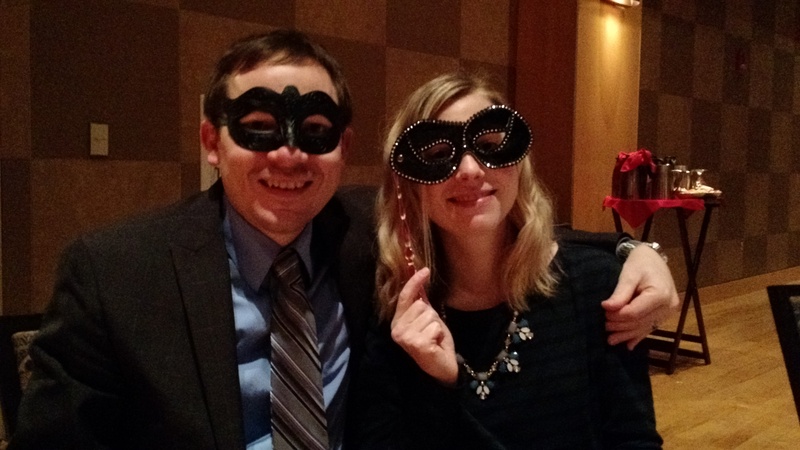 We didn’t have any plans for Valentine’s Day, but we ended up going to a Masquerade Ball with some friends. It included dinner, drinks, masks, and childcare. It was a great deal and a huge plus to eat a good meal and not have to worry about watching the little ones. Sometimes last minute things work out better than planned ones. I finally finished and gave Owen his Valentine’s Day Basket. 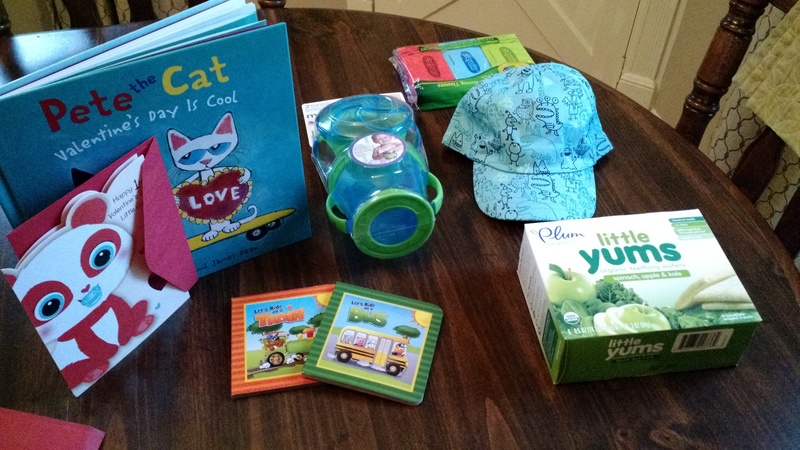 I included a few books, some snack containers, a hat, and Kleenexes in the basket. He pretty much just tried to put everything in his mouth. I guess that means that he liked it. 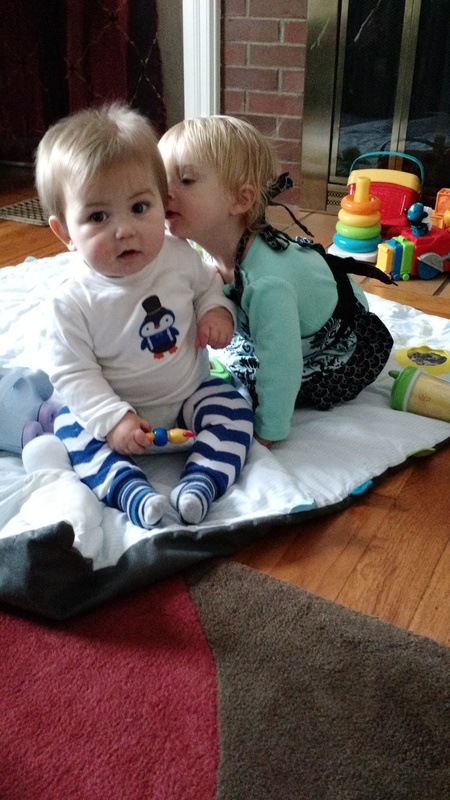 On Sunday Owen finally decided to crawl a few steps forward. Yay, Owen! So Tony figured that it was about time to start to putting together the 2 baby gates that we had ordered. We figured that we needed at least 2 for the tops of both of the stairs. After some fumbling around he was able to get one to fit at the top of our upstairs staircase, but the stairway to the basement was too narrow. Side note, our house is pretty old – built in the 40s. It has a ton of character, but sometimes it is hard to find things to fit. One thing that was in style in the 40’s was to have a million doors in your house. Not sure why this was the case, but it is the case with our house. The previous owners took down most of the doors that weren’t necessary and stored them in the basement. After a bit of searching for the door that fit, Tony decided that he would sand and repaint the door that goes at the top of our basement staircase. That way we won’t have to worry about buying another gate, and we can keep the cold air from coming up the stairs. I just feel bad that it is another thing for him to do with him being so busy already. What can I say? I have an awesome husband. 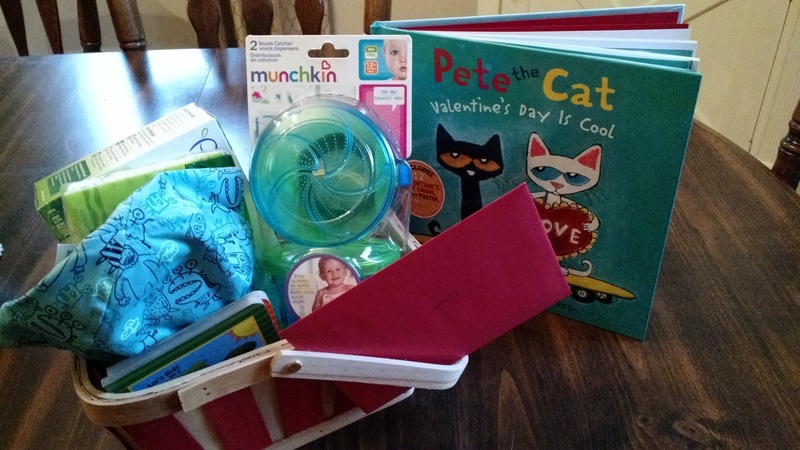 I am still putting together Owen’s Valentine’s Day Basket. Once I have it completed I will post some pictures and let you know what I added. 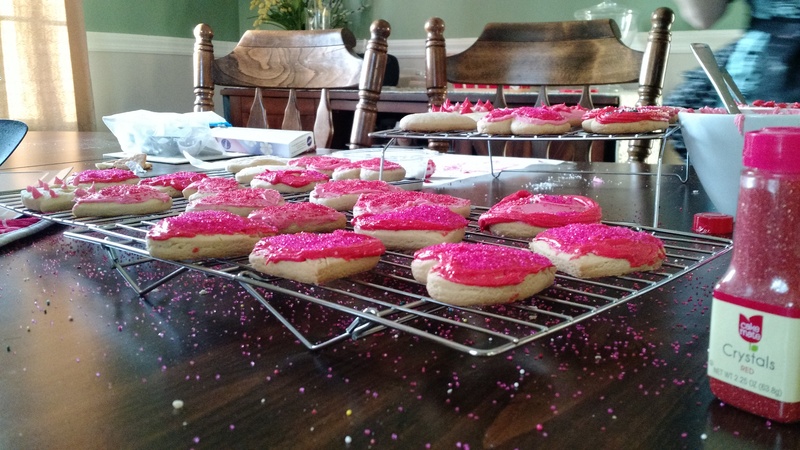 I have a major sweet tooth, and I’ve been wanting to make sugar cookies for a while. Yesterday I was finally able to make some. I just used a simple sugar cookie recipe and my friend Mary made the icing for them. She informed me that the dough needs to be chilled for a few hours before cutting them out and baking them. Woops, I didn’t realize this until she came over to help. Now I know for next time. We used some simple hearts cookie cutters, and I also attempted to cut out the word “Love” using cookie cutters, but I only did one because they took way too much time while trying to entertain two kids. Mary made the icing then we decorated the cookies with assorted sprinkles. While decorating the cookies with the sprinkles Mary piped on a few designs and I simply spread the icing and put the sprinkles on them. I think I might have made more of a mess myself then the kids did. Sprinkles are a lot like glitter in that when using them you will probably find them for weeks to come. I can’t wait until next year when Owen can actually help out a bit. If you are interested in making something a bit more savory check this Sweet Potato Crusted Spinach Quiche recipe below. We made it earlier last week and it turned out really good. Note the sprinkles all over the table. This has been Owen’s first official full week in the older infant room. He was supposed to start last week, but because he was sick most of the week he didn’t officially start until this week. 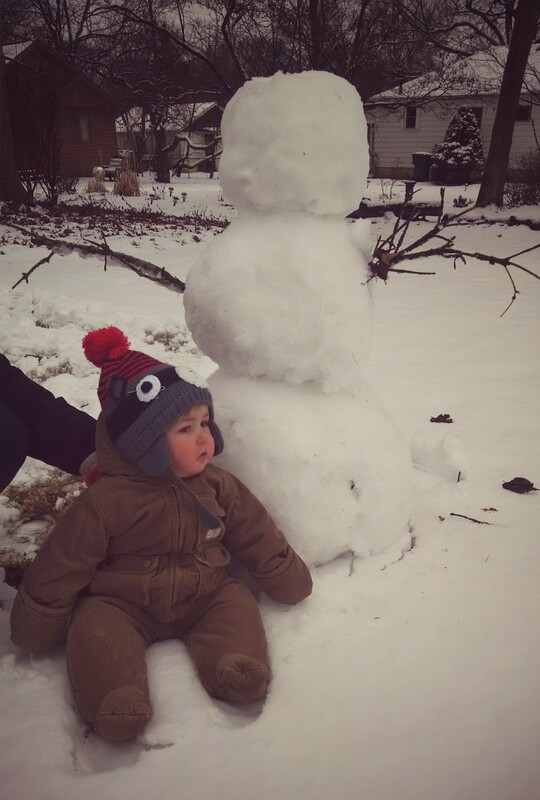 So far he seems to be digging it. I think that he may be intimated by the older kids, but I think he is learning a lot from them too. We have only been making up 4 bottles for him to bring, and he usually comes back with one full one because he gets a morning snack, lunch, and an afternoon snack. It took him a while to get his appetite back but he seems to be eating well again. He really had us worried when he was throwing up last week. I am so glad that he is doing better. I felt like we were missing out on so much while we were taking care of him. I’ve been getting better at feeding Owen table food. Pretty much what we are eating but in very small pieces, but I have noticed that he doesn’t like it when I try and feed him. He wants to make a huge mess by feeding himself. Most of the time there is more on his lap than in his belly by the end of it. I guess it is good that he wants to be independent. Even though Owen can’t pull himself up on his own yet we have started to think about baby proofing. We recently ordered and received 2 baby gates, and replaced our glass coffee table with a new ottoman table. I never liked our glass table, but surprisingly it sold the same day we posted on Craigslist. I think we will eventually sell the 2 glass end tables, but until we find something better we need to have somewhere to put our lamps. 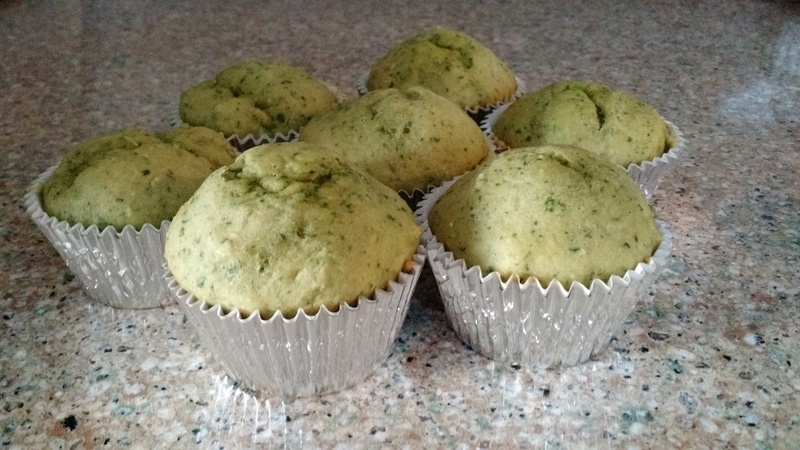 I have been in the baking mood, but I can’t seem to find the time to do it. 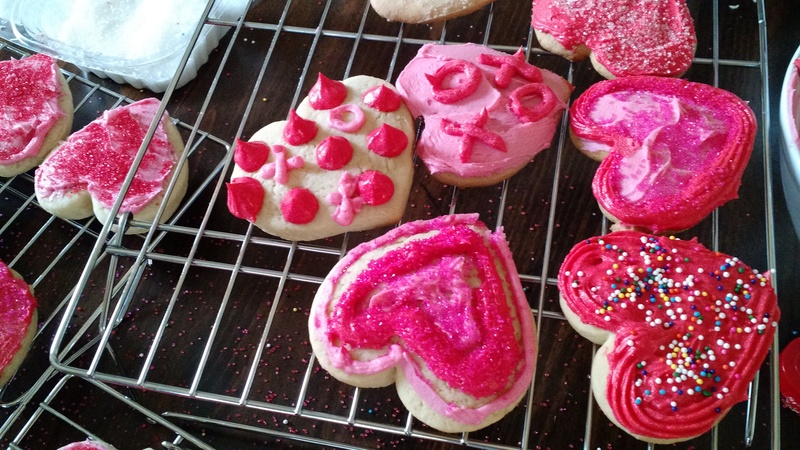 I really want to make Valentine’s Day cut out cookies. I’ve had these “love” and “heart” cookie cutters for so long, and I’ve never used them. I think we got them for a wedding favor years ago. Perhaps this weekend I will try and tackle that. Anyone have a favorite cookie recipe that you love, or are planning to make soon? 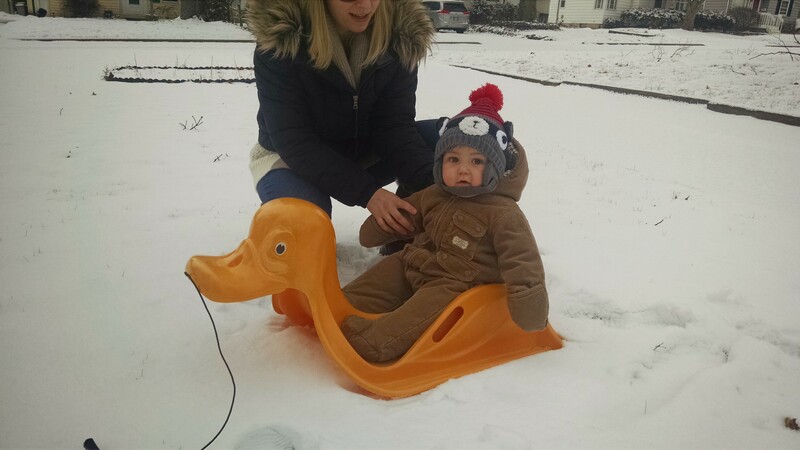 I almost forgot that we had some snow on Sunday, and it wasn’t freezing cold so we were able to bring Owen outside to experience the snow for the first time. 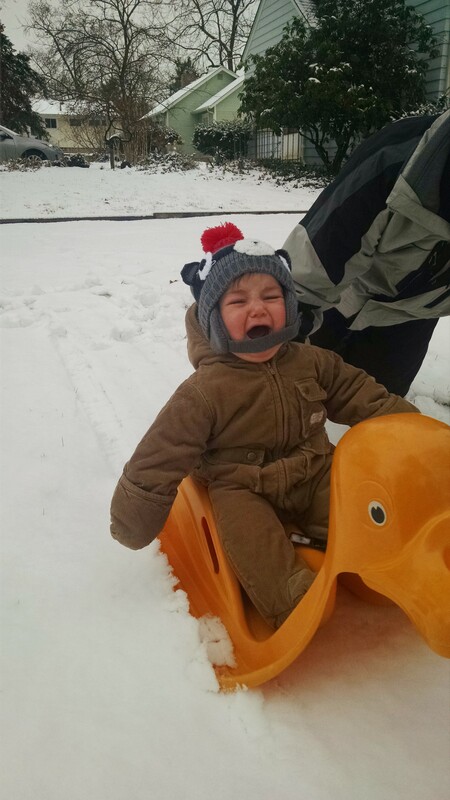 As you can see from the pictures below he didn’t particularly love it. He was fine when we were holding him, but once we sat him down he wasn’t having it. I am sure next year when he is more mobile he will enjoy it.